-- Select a Size -- X-Small Small Medium - Out of Stock! Large - Out of Stock! X-Large 2X-Large 3X-Large - Out of Stock! 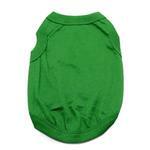 Our Barking Basics!® Dog Tank Shirt in Emerald Green is the perfect shirt for almost any pet at an exceptional value! 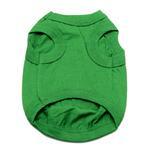 This Barking Basics!® Dog Tank Shirt in Emerald Green is sure to be your dog's favorite with a comfortable fit. Great on its own or use this tank year round by layering it under coats and sweaters to help keep shedding down and for extra warmth. This pretty dark green shirt is a great choice for Earth Day, St. Patrick's Day, Christmas or any festive event. For even more fun, add iron-on patches, embroidery, or screen printing to commemorate an event or just for cuteness. The easy-care soft knit is made of 65% cotton and 35% polyester. Machine wash, cold and dry flat for best results. Barking Basics Dog Tank Shirt - Emerald Green Customer Photos - Send us your photo! barkley relaxing at a hotel in his comfortable Barking basic t shirt! Hillary has one of these shirts in every color. The green is perfect for all seasons, and can be dressed up for Christmas and St. Patrick’s Day. 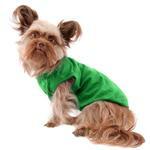 Hillary was feeling a bit festive in the green Barking basics tee! HENRY'S LOVING HIS NEW EMERALD GREEN BARKING BASIC SHIRT. STYLISH AND COMFORTABLE! Just give me that treat and I'll let you keep your fingers! I'm a tiny little leprechaun! I'm not Irish... but kiss me anyway ? Posted On 03/08/19 by Ann D from Surf City, NC Yes, Ann D recommends this product! Bought a size medium for my 10 pound poodle/bichon ... it was way too small. Had to order a large. Posted On 07/20/18 by Wappingers Falls from Wappingers Falls, NY Yes, Wappingers Falls recommends this product! our little guy looked cute in this t shirt and was great for a cooler day. Love these tanks! So easy to slip on and off and obviously comfy for my fur baby. I say grab these in all the colors as you can never have too many of them. By the way, this emerald green is very pleasing to the eye! Nice shirt, love the green! Nice tank for my doggy. I love the material, the way they wear and most importantly the way they wash so well and tend to maintain looking good for a very long time. I am active in our local CERT chapter and wear emerald green shirts identifying myself. My Service Dog, a Miniature Schnauzer, is always with me and needed matching shirts. This tank top was the exact colour I needed, fits her well, and washes easily. We make a great looking team! Posted On 03/25/18 by Kelley F from Iowa City, IA Yes, Kelley F recommends this product! Got mediums for my boys that are 8.5-9lbs. They have 14-15" chests and are 12-13" long. The necks were big on them at 10 and 11" but I can take them in a little. Overall, great shirt! Got the small for my Chihuahua girls that are 3.8-4.1lbs. They both have a 12" chest and 9-10" long. The necks were a bit big on them at about 8.5". Overall, great shirts! Got the xs for my 3.6lb Chihuahua. She has a 11.5" chest and is 8" long, the neck fit her great too her neck is almost 8". This fit her perfectly for St Paddys Day! Posted On 03/17/18 by Christine G from Lake Worth , FL Yes, Christine G recommends this product! We love all the barking basic tees for our girl. This particular one in green is perfect for Christmas and St. Patrick ‘s Day. It fits well, and washes well with frequent wears. Posted On 03/15/18 by Kelley F from Iowa City, IA Yes, Kelley F recommends this product! Ordered these for our Chihuahuas. Got the Medium for our boys who are 8.5-9lbs. They have 14-15" chests and are11.5-13" long. Ordered these for our Chihuahuas. The Small fits our girls who are 3.9 and 4.1 lbs. They have 11.5-12" chests and backs are 9.5-10" long. Ordered these for our Chihuahuas. The XS fits our 3.6lb girl 11.5" chest and 8" length. True green color, perfect for St Pattys day! Love the color! Very well made and looks adorable. LITTLE SHIRTS.... LITTLE CARE....LOTS OF LOVE! Great teeshirts....wash up nicely....and a great price. What more could you ask for...... WONDERFUL COLORS!!! We got this for Super Bowl LII to support the Eagles and it will come in handy for St. Patrick's Day and springtime, too. It is a vibrant shade of green, fits well, and is lightweight so dogs can move about unrestricted while playing and rough housing!